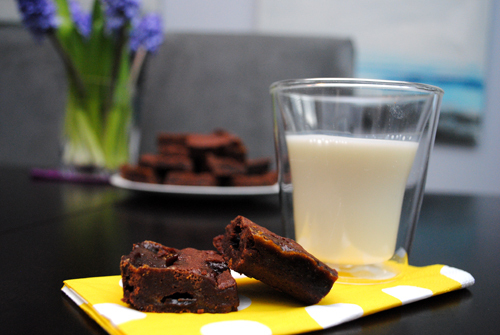 Inspired by Smitten Kitchen , these are possibly the best brownies I have made or eaten. I will definitely make these again. Cover a jelly roll pan with parchment paper and spray with cooking spray, set aside. In a large pan, melt 1 cup sugar until golden brown, stirring occasionally. Remove from heat and add 1/2 cup (1 stick) butter, stir until butter is melted. Stir in the heavy cream and 1/2 tsp. sea salt flakes, and return to heat to remelt the sugar and darken the color slightly for 1 to 2 minutes. Pour the caramel onto the parchment paper and freeze or refrigerate until firm, approximately 2 hours in the refrigerator or 45 minutes in the freezer. Remove caramels sheet from the pan and peel off parchment. Cut into pieces, approximately 1-inch by 1/2-inch. Place piece back on parchment and chill in the refrigerator until ready to use. Preheat oven to 350 degrees-F. Using a large mixing bowl as the top of a double boiler over simmering water, melt chocolate and remaining 1 cup (2 sticks) butter. Removing bowl from heat and add remaining 2 cups sugar and whisk until smooth. Add eggs one at a time, scraping the sides of the bowl with a spatula in between each egg. Add vanilla extract and remaining 1/2 tsp. sea salt flakes, and stir until combined. Add flour and stir until incorporated. Line two 8-inch x 8-inch cake pans or one 9-inch x 13-inch pan (the one pan method will make thicker brownies) with parchment and butter the top of the parchment with the additional butter. Pour approximately one-third of the brownie batter into the bottom of the pan, spread out with a spatula to be sure the is an even layer. Place one-half of caramels on top of batter evenly. Pour the next one-third of brown batter over the caramels. Place remaining one-half of caramels on top of batter. Pour remaining batter over caramels, it is okay if the caramels are not covered completely. Bake brownies for 15 minutes, then rotate pan 180-degrees and continue baking for an additional 15 minutes. Transfer pan to a cooling rack and leaving in the pan until room temperature, about 1 hour. Turn brownies out and peel off parchment, and place on a cutting board or cookie sheet. Transfer to the refrigerator and chill for at least 1 hour. 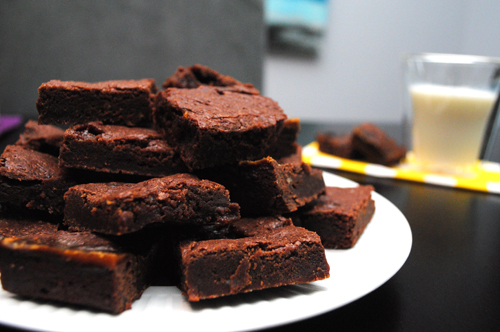 Cut brownies until 1-1/2-inch squares and serve at room temperature. Store in the refrigerator to keep the caramel firm.